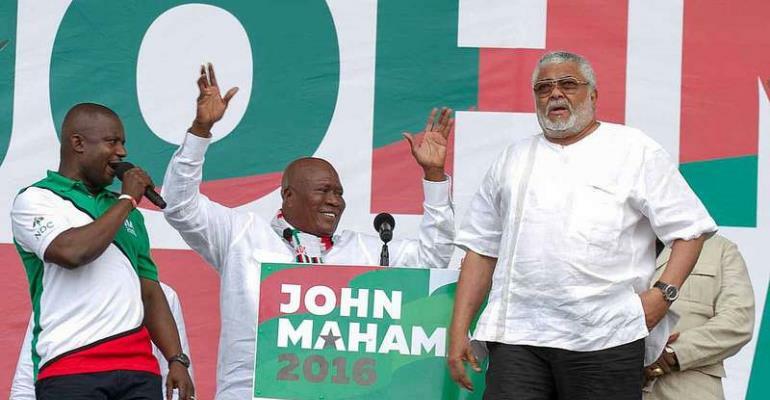 Although Former President Jerry John Rawlings has recently renewed his membership card as a member of the NDC,Director of Communications for Ghana Gas Company, Ernest Owusu Bempah has hinted with all certainty that the Founder of the opposition National Democratic Congress (NDC) will not campaign for the party in the 2020 general elections. Speaking in an exclusive interview with Justice Kwaku Annan ,host of ‘Ghana Must Know’ on Accra-based Hot 93.9FM,Owusu Bempah who double as the Communications Director for the National Democratic Party (NDP), the NDC will never receive the joy of regaining power since their only hope of that ever happening lies in the hands of Rawlings whom the party has taken for granted. "It will be difficult for NDC to come to power in the next 15years because the only person who holds the umbilical cord of the NDC is J.J Rawlings. In 2020 Rawlings will not go and campaign for the NDC. NDC is going to be a political midget because J.J will not work for people to come to power, enjoy and disrespect him after everything. "The only person that can bring NDC to power will have to be someone from the Rawlings' family. Look, In 2018, NDC won the elections genuinely because Rawlings single-handedly campaigned throughout the country, strategize with them and brought them to power... In 2012, it ended up in court because they (NDC) stole the mandate of the people and I can clearly state it. But in 2016, the NPP and all political forces marshalled to guard against election rigging, that is why Nana Addo won overwhelmingly." He categorically told Justice Kwaku Annan. Kindly watch Owusu Bempah's interview with Justice Kwaku Annan in the video below!